Can Dogs Cry Tears? Do They Cry Out Of Sadness? Today’s question: can dogs cry tears? Scroll down for detailed answers. Deciding upon a pet is often a difficult decision. With such a wide array of animals to adopt and to love, how is one supposed to choose their forever companion? One may lean towards a dog for adoption, since dogs have such a strong camaraderie and reputation with humans as being a good best friend. Dogs have so many positive attributes, that this animal is a pet owner favorite, many times over. Getting a pet dog is probably the best thing you can do for yourself if you want a pet that displays emotions. Having a pet that seems to understand you, and you are able to understand it, is a blessing to all pet owners. Having a rapport with an animal is not only fulfilling, but also a healthy aspect of life. 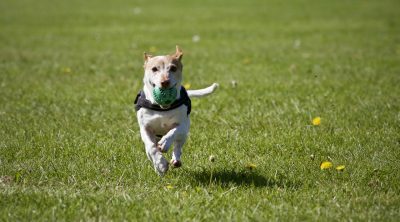 You will develop a deep emotional connection with your dog and you may be surprised that you will even know what your pet is thinking. We do know for a fact that dogs experience feelings, such as sadness, happiness, and surely anger, but can dogs cry tears? Can dogs cry tears? Do they really cry out of sadness? 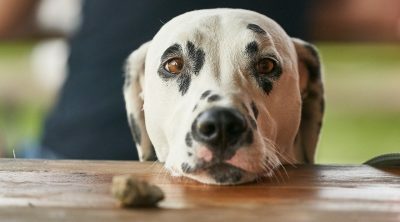 Why does your dog whimper? What are the doggy tears? Should you worry about the tears? Is your dog developing tear stains? Should dog tears be dried or wiped? Yes, dogs can cry, but not with tears. We have all heard a dog cry, whether in person or through a movie, but no one really sees a dog with tears that we humans have when crying. Dogs do cry, just not with the tears and the physical responses of their masters. Dogs cry through whimpering and whining. Dogs are usually appeased quickly and do not prolong their crying unless in deep pain or are distraught. Crying dogs are sad dogs, but you must be able to be in tune with your pet to determine why the dog is crying. Dogs’ eyes can become watery, but this may not be due to emotional reasons. People’s eyes become watery or teary if they experience feelings of sadness or rejection, or when an unfortunate incident occurs. Dogs have tears due to different reasons completely and not due to emotions. Dogs do not cry tears out of sadness. When dog are sad, they are quite capable of expressing their feelings of sadness. They do express their emotions, but through body language and vocalizations. Sad animals will make vocal noises (whimpering and whining), stop eating, move slowly, or sleep all the time. Once you know your dog well enough, the audible whining sound can mean a variety of things, which is likely to leave you to guess the reason why it is making this sound. Babies tend to have a different cry for every need or ailment, and the same is true for a dog. Dogs without the ability to speak lack the words to use to express pain. Dogs have to rely solely on whimpers to alert their owner of a problem. A whimper from being hurt may be different from a whimper that is a request to go outside. Listening closely to your dog and watching his/her behaviors are key to deciphering the needs and happiness of your dog. After some time, you will know which whimpering means that your dog wants you to open the door as it understands that soiling your rug is bad. You may also identify the whimpering caused by anxiety when it understands that you are about to leave home. Dogs may see your suitcase, see you pick your car keys, or notice other signs that you are about to leave and simply whimper the entire time you are getting ready. Whimpering because s/he needs to go outside or does not want to be left out of a car ride is very different from crying. Whimpering is more of an indication of need or disappointment rather than pain or sadness. Listen to your pup when s/he whimpers during the day so that you are able to read him/her for when true emergencies and possible crying occur. If you find whimpering to be annoying, you can control the whimpering by doing some diligent training. It would be a good idea to train your dog to respond to the command ‘quiet’, as this will make the whining and whimpering stop. Training your dog not to whimper can be a good thing if the whimpering is excessive. However, whimpering may be one of the only ways in which your dog can speak to you, therefore you must be able to tolerate the whimpering so you are able to care for your pet in ways they need. Dogs also cry or whimper if they are hurt or sick. This will be visibly different from the whimpering discussed earlier. If you see your dog lying down or sitting or even walking while making a continuous whimpering sound, you need to be attentive. The whimpering should also sound different than the everyday whine. 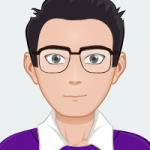 If this situation persists and you are unable to identify the cause or resolve the issue, it may be wise to visit the veterinarian right away. 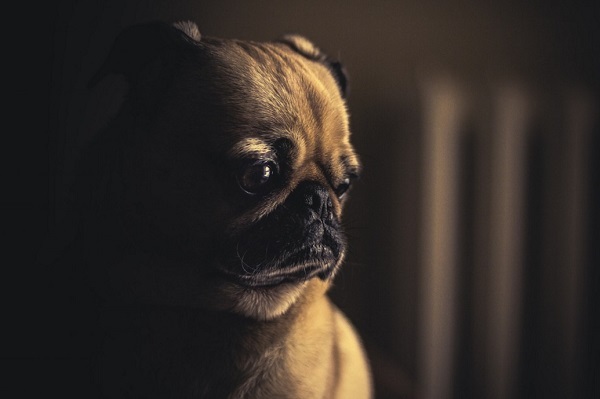 Whimpering when moving, or continuous whimpering while remaining still is a good indicator that a problem exists and needs to be remedied quickly. Dog tears are produced by tear ducts that are present in their eyes like most mammals. These are essential for providing adequate moisture so that their eyes can function normally. In the usual course of things, these tear ducts are used by dogs particularly for draining the moistness into the throat or mouth. In a situation where the tear ducts get blocked, the tears end up flowing through their eyes onto their cheeks. Commonly called epiphora, some breeds are more inclined to the development of this issue, while others are less susceptible. The basic reason behind the possibility of being affected by epiphora is the dog’s facial shape. Some dogs are able to retain the fluid within their eyes, while others can’t. 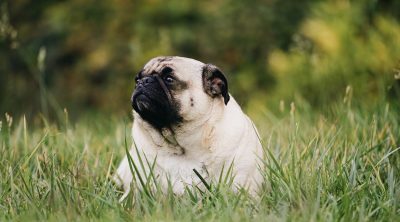 Some breeds that frequently have tears are bulldogs and pugs, which is due to the squished shape of their faces. If your dog has doggy tears due to epiphora, you need not worry as it is not a very serious issue. Doggy tears are also important because an eye that is able to be moisturized through tears is an eye that is able to remove debris. Dogs need tears to keep their eyes clear and remove possible objects like sand, crumbs, a bug, sawdust, etc. Dogs tend to get into a lot, and put their faces into places humans would not. Tears in dogs keep the eye healthy, even if the tear does not accompany crying and roll down the cheek in a dramatic way. Epiphora can occur due to many very simple reasons. Just as our eyes become watery due to sinusitis, so can your dog’s. An inflammation of the sinuses can be caused due to a variety of reasons, such as dust, conjunctivitis or even foreign objects. Dogs surprisingly have allergies similar to humans. Dogs have evolved from the wolf to be strong and sturdy, able to withstand the elements in the while. While this may be the case, allergies still happen and dogs do not have access to their local pharmacy to pick up tissues and Claritin. In this regard, the eyes of the dog must work overtime to keep the eye clear, moist, and away from possible infections. The eye must work hard to alleviate possible allergens in the environment that dogs must deal with. 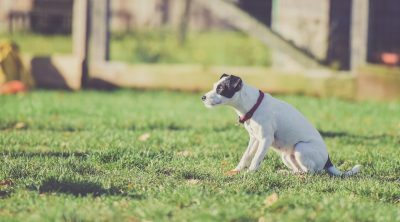 There is also the possibility that your dog has a congenital shortcoming, such as the absence of connections between the tear draining process and the eye, or poor functionality due to excessive links. Spaniels, bulldogs and poodles are often susceptible to such conditions. 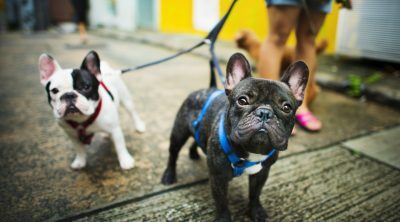 Many times, when choosing a dog through a breeder, you will be warned in advance of the type of eyes issues your dog may have inherited or have a predisposition for. Researching the breed of your dog may be important to prevent or treat crying and tears in your pup. A vet may also be able to give you advice and probably treatments for any crying your dog may seem to have. Or any eye allergies that have developed. Ectopion is another very common issue faced by certain breeds that develop epiphora. In this case, the dog’s eyelid turns outwards due to a birth defect, post traumatic scarring of the eyelids or paralysis of the facial nerves. Often the larger and more active dogs are likely to develop this condition due to their tendency to indulge in rambunctious activities. Especially susceptible are Great Danes, Bloodhounds and Spaniels. There is also the possibility that your dog tries to get something out of its eye and inadvertently scratches its iris, which would result in an inflammation. If your dog has scratched his/her eye, you must visit the vet to have the eye cleaned and treated, and to pick up medication. Dogs have eye drops that may be used to treat the eye and prevent infection. In most circumstances, the tears caused due to epiphora are not an issue and your dog is not likely to be affected by this. If however, the symptoms are more serious, you may then want to consult the vet. If the tearing is continuous, there may be blockage in the eye that should be checked. If the tears show the presence of some color, which could be blood or a yellow substance, there is the possibility that there may be a more serious illness. If the tears or watering continues beyond one day, this should be investigated. Possible reasons could be glaucoma, or a fractured facial bone. Epiphora can cause tear stains. Even if your vet has ruled the epiphora out as harmless, your dog’s appearance will still be affected. The tear stains will be particularly noticeable among dogs with white coats, like poodles or bichon frises. If the epiphora is mild, then the tear stains are likely to develop after a while, however, if the stains develop very quickly, you should visit the vet for some preventive treatment so that the epiphora goes away. Another possible reason for tearing is a food allergy, which you can investigate and resolve. There is also the possibility that the drinking water available to your dog is of poor quality which is making the epiphora stronger. You can also use eye wash and shampoo regularly so that the stain building is slowed down. If your dog is furry, keep the fur near its eyes trimmed. Sometimes, it is the long hair that is causing foreign objects to get stuck in its eye and result in crying. Your dog may appear to cry his its tear ducts are not functioning properly. To reduce the discomfort, you can use a wet towel to wipe away the discharge. Warm, wet towels are not only comfortable for your dog to have on their eye, but also soothing and effective. You will have to be very gentle as your pup may not trust you rub their eye initially. However, with careful handling your pooch will learn to sit still while you wipe his eyes. For chronic issues, you should consult your vet. Here is a video of a sad dog who just lost his brother. You can see the dog is sad but not actually crying tears. You should now have better understanding about the question ‘Can dogs cry?’ You may be relieved to know that your dog does not cry tears due to sadness.